The success of Chinese Tennis star Li Na in Australia has started a boom in Asian visitors that could be “more valuable that Oprah” for tourism – according to Australian Open officials as reported in the Herald Sun. She is expected to soon overtake Maria Sharapova as the leading female tennis brand and has signed lucrative endorsements with Nike, Rolex, Häagen-Dazs, Mercedes-Benz and Samsung among others. 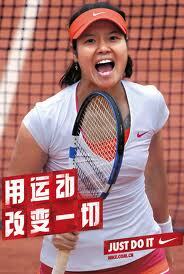 Li Na is now the biggest homegrown Chinese brand in the sports market.